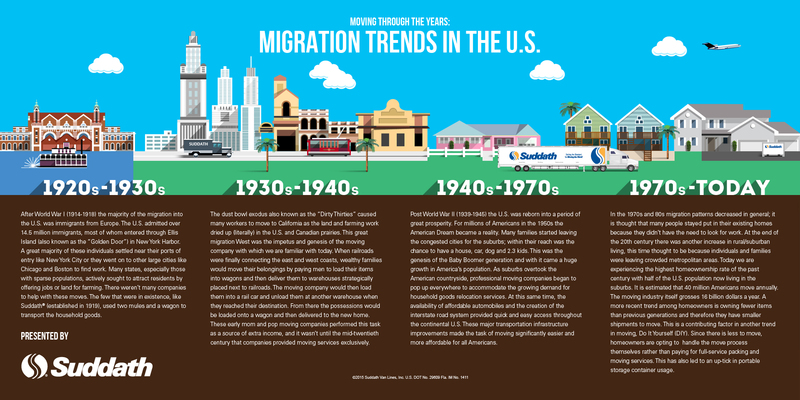 Migration Trends in the U.S.
Migration patterns in the United States have changed many times over during the last century. Many factors have influenced the reasons for relocating, most notably economic reasons and employment availability. As the need (and financial ability) for moving in America has risen, the moving industry has grown to meet this demand. From small mom-and-pop businesses using mules and wagons to move families across town, to the many full-service and DIY options that are available today, moving has expanded to meet the unique needs of everyday Americans. Join Suddath as they look back on the migration trends that helped shape our nation, as well as the moving industry.